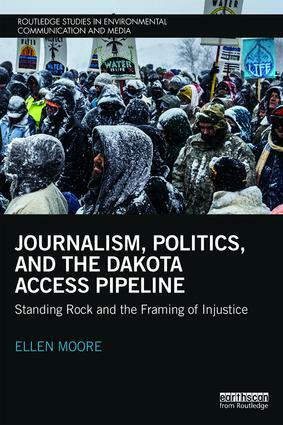 This book explores tensions surrounding news media coverage of Indigenous environmental justice issues, identifying them as a fruitful lens through which to examine the political economy of journalism, American history, human rights, and contemporary U.S. politics. The book begins by evaluating contemporary American journalism through the lens of "deep media", focusing especially on the relationship between the drive for profit, professional journalism, and coverage of environmental justice issues. It then presents the results of a framing analysis of the Standing Rock movement (#NODAPL) coverage by news outlets in the USA and Canada. These findings are complemented by interviews with the Standing Rock Sioux Tribe, whose members provided their perspectives on the media and the pipeline. The discussion expands by considering the findings in light of current U.S. politics, including a Trump presidency that employs "law and order" rhetoric regarding people of color and that often subjects environmental issues to an economic "cost-benefit" analysis. The book concludes by considering the role of social media in the era of "Big Oil" and growing Indigenous resistance and power. Examining the complex interplay between social media, traditional journalism, and environmental justice issues, Journalism, Politics, and the Dakota Access Pipeline: Standing Rock and the Framing of Injustice will be of great interest to students and scholars of environmental communication, critical political economy, and journalism studies more broadly. Ellen Moore is a Senior Lecturer at the University of Washington Tacoma, USA.